Once we have understood how our device boots up, we will then cover the technical aspects of how to flash our device. As in the boot sequence, the 3 main components that need to be transferred -”flashed”- to the board, are: The Bootloader, the Kernel and the OS (Android). We cover them in different posts, continuing here with the OS – Android. Once the boot loader has loaded the kernel, the following step is mounting the root file system (Please refer here for further details on the boot sequence). In this post we will go through the process of compiling the Android system and uploading it image to our device. Sometimes, this image needs to be modified. Refer to this post in order to get more information on how to mount/unmount the Android system image. Once again, this tutorial will be centered on a specific board, the ODROID-PC from hardkernel and therefore some of the information provided here is based from their documentation. Please note that porting this tutorial to another board should be straightforward for most cases, and at least should give a very good idea of what has to be done. The ODROID-PC uses a Samsung processor, a Exynos 4 – ARM Cortex9. As it is the case in many other processors, some of the libraries needed to interact with it, are proprietary and therefore cannot be distributed. However, the binaries can be re-used when modifying the software in a board we have paid for. For this, we need to remember to recover those libraries from our board and located in the source code of our system so that they are compiled into the system image we will flash in our device afterwards. The libraries that have to be saved change from company to company and from device to device. Here we will state the libraries we had to extract from our specific board (we will also mention the libraries for the ODROID-A4, since most of them, are common libraries). For extracting files from our device we will make use of adb pull, which will transfer the libraries from our device to our host machine through a USB interface. In our case, the Exynos 4210 we have as a processor, implements a variant of the Mali GPU, which is an ARM proprietary Graphic Processing Unit (GPU). 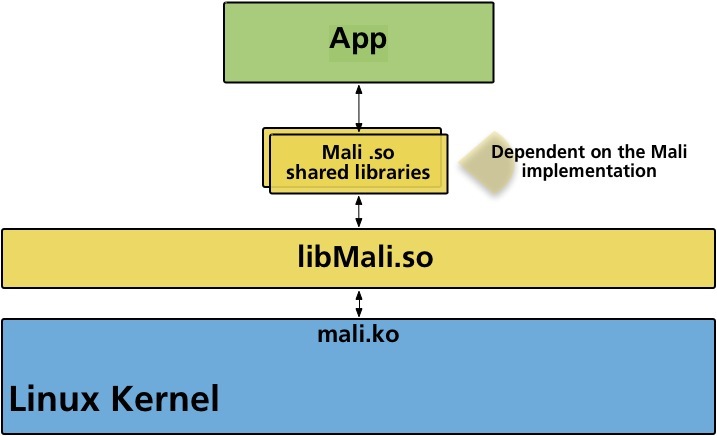 The Mali library is mainly a component that allows a given application to communicate with the mali kernel object (mali.ko) and use the Mali GPU. The Mali library is actually composed several shared libraries (.so extension) that work together, and we will need to extract them all. This entry was posted in Android System Development and tagged Android System Development, Compile Android, Embedded Systems, ODROID, root filesystem. Bookmark the permalink.